George Graham reviews Oracle Hysterical's "Hecuba"
It was about five decades ago when art rock first began to appear. Best known for the bringing elaborate arrangements to rock bands, the movement also included rock versions of classical pieces. Usually, it was electric instrumentation, but occasionally, some bands experimented with bringing more classical instruments into rock, such as a concert harp or a cello. Art rock faded from the popular scene with the rise of the alternative movement, in the wake of the punk scene, which was art rock’s diametric opposite. But in recent years some interesting hybrids have arisen, especially with the old fashioned high walls between classical and rock musicians being largely erased, and ever more classically trained performers becoming involved with rock and alternative projects. Among the more interesting that we have featured on this series are My Brightest Diamond, and Night Tree, the latter being students and recent graduates of the New England Conservatory of Music. This week, we have another fascinating example, a group called Oracle Hysterical, who bring classical instruments like bassoon and viola da gamba to an alternative rock-influenced setting, and music inspired by classical literature. The band is called Oracle Hysterical, a the describe themselves as “part band, part book club.” Their new releases is called Hecuba. Oracle Hysterical is based in Brooklyn, New York, and consists of twin classically trained brothers, Brad Baliett who plays bassoon, and Doug Balliet who plays baroque bass, the viola da gamba, plus guitar and bass. Also in the group are Majel Connery, who is vocalist, and Elliot Cole, who plays the more rock-oriented instrumentation including guitars, keyboards and bass, and drummer Jason Treuting. Oracle Hysterical has been making music since around 2009, most of it based on historical literature such as tales from the Brothers Grimm, and works apocryphally attributed to Shakespeare. Much of their music has been commissioned for orchestral performances. Hecuba is their second formal album, after their debut last year called Passionate Pilgrim, based on those poems that were found not to be Shakespeare’s. Hecuba is based on the Greek tragedy by Euripides, written about 420 BC, about the disgraced Queen of Troy of the same name, her capture and her revenge. It’s not exactly your fodder for an alternative band, but Oracle Hysterical creates a fascinating and highly eclectic musical setting for it. The mixture of classical and baroque instrumentation with the electric guitars and some edgy alternative rock arrangements makes for listening that is anything but filled with clichés. The band brings in atmospheric arrangements at times, but also cranks it up, sometimes within the same tune. The lyrics borrow from the original play, mainly in the use of the characters and situations, and occasionlly veering off into some other territory. Sometimes they are more successful than others with their eclecticism, but it’s all quite creatively done. 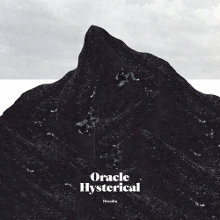 Hecuba, the new release by the New York based group Oracle Hysterical is a fascinating, eclectic musical trip, blending classical and baroque instruments with a kind of alternative rock sensibility plus some folk and even new age thrown in. And it’s all based on a classical Greek tragedy. The result is highly creative, and while certainly not pop material, it’s an album that holds ones interest from start to finish. The experimental nature of the arrangements is sometimes a little uneven, but overall, it’s an excellent piece of art. Our grade for sound quality is about a C at best, mainly because of the hyper-compressed sound that is common in alternative rock apparently aimed at the tiny speakers in cell phones. This kind of music, with its wide range of sonic colors and creative arrangements, really calls for a classical approach to mastering, with the music’s loudness allowed to ebb and flow. As it is, it’s all more or less at the same loud volume, and the sound is dull and lifeless.